This book stems from a major research report prepared by a study group established at BIICL. 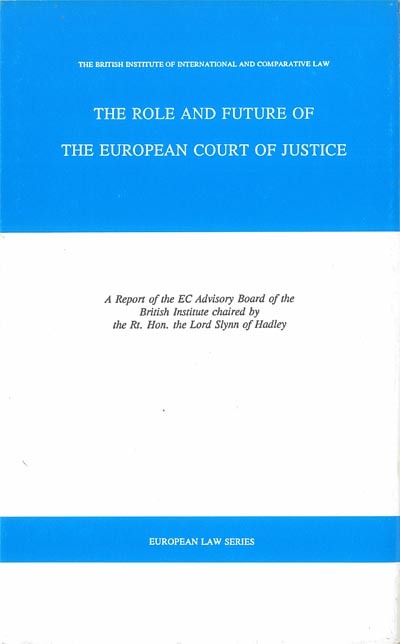 It fulfils a threefold purpose: First, to provide a report of a study group comprised of experts with specialist knowledge and experience of the procedures and working methods of the ECJ. Secondly, to provide an example of the working methods. Thirdly, the report represents a contribution to the debate on the future of the european Union. The report contains careful analysis and specific recommendations. The book's contributors include: The Rt. Hon. the Lord Slynn of Hadley (Chair), David Anderson (Brick Court Chambers), Professor L. Neville Brown, Dr. en Droit (University of Birmingham), Eileen Denza (University College London), James Flynn (Brick Court Chambers), Michael Hutchings (EC Consultant), Jeremy Lever QC (4 Raymond Buildings), Carl Newman CB (of the Institute), T.J.G. Pratt CB (Counsel to the Speaker), Professor H.G. Schermers(Europa Institut, Leiden), Professor J.A. Usher (University on Edinburgh), David Vaughan, QC (Brick Court Chambers). "Role and Future of European Court of Justice"